if you are a visitor or newcomer. Christ our Hope is risen! Christ dies to rise again so that his Father will be glorified. We too are brought back to true life in Christ. If we die with him, we will rise with him, and be living witnesses to the power of the resurrection. Victorious king, thy mercy show! Amen. Parish Breakfast in the Parish House. The Sick: Dina Iceton, Julie Hall, Robin Sunley, Margaret Cooper, Wendy Webster, John Byrne, Joan McIntyre, Flo Elsom, Patrick Doherty, Cath Simpson, Pat MacDonald, Baby Reggie, Michael Fletcher, Father Elkin, Penny Newman, Jack Nugent, Mary Pretence, Win Parkinson, Elizabeth Leeman, Elaine Robertson, Elizabeth Rawling, Martin Parsons, Stephen Terney, Suzanne Brown, George Arthur Michael Shaw, Peter Taylor, Andrew Gwilliam, Alan Doleman, Christopher Fletcher, Catherine Scrope & Christopher Smith. YEAR’S MIND NAMES & DATES to Mrs Jos Thompson (0776 382 0655). PLEASE BE PART OF OUR PLANNED GIVING SCHEME. More information from Miss Nicola Reeves (0778 858 7474) & Mr Harry Alderson (01325 284186). 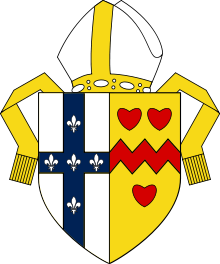 The Darlington Ordinariate has large financial commitments and needs regular and sacrificial giving. WE HAVE TO BE FINANCIALLY INDEPENDENT. PLEASE HELP US, AND CONSIDER GIVING BY STANDING ORDER. If you are a taxpayer, please sign up to our gift aid scheme and use the gift aid envelopes. PLEASE JOIN THE 500 CLUB. New members always welcome. Please contact Mrs Jos Thompson at Parish Breakfast or on 0776 3820655. LAST WEEK’S WINNERS – Sunday 14th April: - £10 (266) Paul Cooper £5 (256) Brian Jones. Very many thanks for your continued support. Please support our ORDINARIATE FLOWER & MUSIC FUNDS– donations to Father Grieves at any time. Do not abandon yourselves to despair. We are the Easter people and alleluia is our song. Parish visit on Saturday 11th May. Please place the following items: sugar, fruit juice (non-chilled), tinned meat & fish, tinned potatoes, breakfast cereal, tinned fruit and vegetables, biscuits, chocolates, jam, pasta, pasta sauce, tinned rice pudding, tinned tomatoes, tea, coffee & rice in the basket at the back of church. Many thanks for your continued generosity. SAFEGUARDING. The parish is committed to safeguarding and promoting the welfare of children and vulnerable adults and expects all staff and volunteers to share this commitment. Safeguarding Officers: Christine Van Mourik and Jos Thompson.